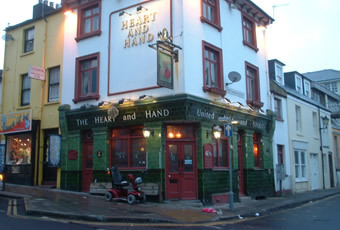 Discovered this pub late on Saturday night and it made our trip to Brighton very memorable. Not only is the jukebox one of the best I've encountered but any place that doesn't mind forty and fiftysomethings dancing gets my vote. Will be back when we're in Brighton again. An old school boozer in the centre of Brighton. No frills. Two ales on tap were Harvey's Sussex Best and Doom Bar (which was not available). A nice place to stop to see how pubs used to be, cosy and pleasant atmosphere on a cold winter's day. Proper turnaround. Always was a good looking hostelry but the service used to be disgusting. Now the service is friendly, the content on the jukebox is sublime and the beer is decent. Always wanted to like the Heart and Hand, now I can without apologising for it. This was the first time I had been in this pub although I had passed it several times and always commented on the impressive exterior (the tiling and old brewery lettering as well as the leaded windows - all superb). 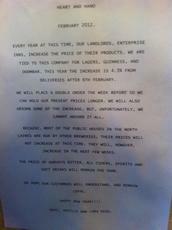 A good banter with the licensee about the trade in general; his rent and the cost of everything! The Harveys Best was fine and had it not been for our busy schedule we would have stopped for another. Is it a Brighton thing to have as many posters on the walls as is possible? This is not the first pub to have a huge display.